When we travel Patrick and I know a place is a keeper if we are already planning our next visit there before we have even left. That was the way it was when we were in Barcelona for part of our honeymoon. It was love at first sight – amazing architecture, art, history, the beach, the food and the people make it the perfect place to visit. 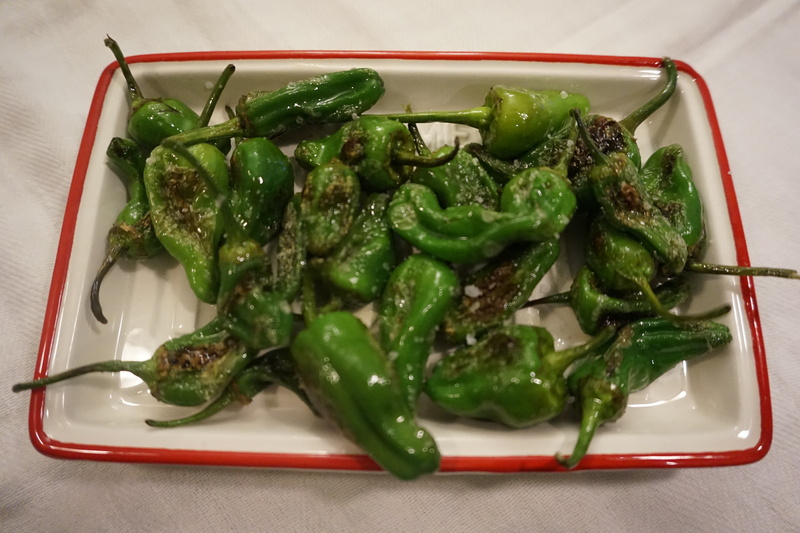 One of my favorite memories was sitting at a lovely outdoor cafe with a glass of delicious rioja eating padron peppers that had been blistered and salted. Everything about that snack was perfect – the bright berry flavor of the wine, the salty and spicy peppers and the smell of fresh herbs wafting over from the wall of plants near us (I loved it so much I took the pic above). 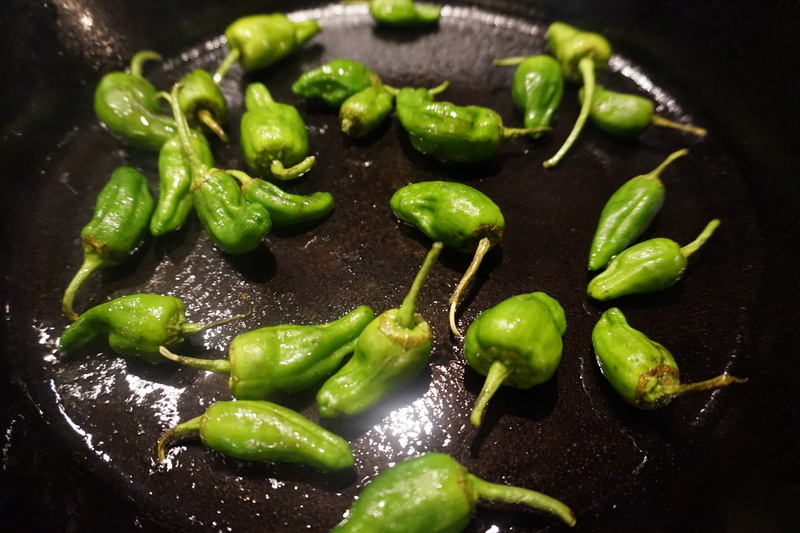 So when padron peppers hit local markets here in late summer I am quick to pick some up and try to recreate that magic at home. It’s also about the simplest appetizer you will ever make. 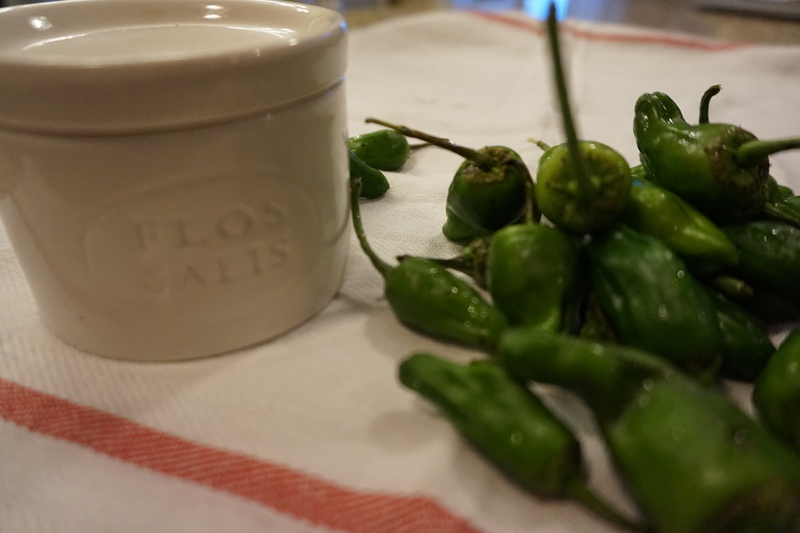 Padron peppers, also called shisito peppers are small green peppers that can vary in their heat level. It’s the equivalent of russian roulette of peppers as some are very mild like a bell pepper, and some can be quite hot like a jalapeno. The most traditional way to eat them is to pop the whole pepper in your mouth, biting off at the stem. Simply cooked in a little bit of olive oil until the skins blister and then tossed with high quality sea salt these peppers are a little crispy, warm, salty and firey. SO good. I like them with a good spanish red but they would also be great with cava or a gin and tonic. They should be in the East Coast farmers markets now through October if we are lucky. Grab some and try the spice roulette yourself! Heat a skillet (preferably cast iron) over medium high heat for several minutes until quite hot. Pour in 1 tablespoon of olive oil and add the peppers. You want a single uncrowded layer of peppers so do in two batches if your skillet is small. Cook for 3 to 4 minutes until the skins blister and darken in spots, stirring occasionally. Sprinkle with sea salt and repeat if you have a second batch. Serve immediately. Heat a skillet (preferably cast iron) over medium high heat for several minutes until quite hot. Pour in 1 tablespoon of olive oil and add the peppers. You want a single uncrowded layer of peppers so do in two batches if your skillet is small. Cook for 3 to 4 minutes until the skins blister and darken in spots, stirring occasionally. Sprinkle with sea salt and repeat if you have a second batch. Serve immediately. You find these at farmer’s markets? What about Whole Foods maybe? Did my mom comment on your blog yet?? She apparently made your spare ribs and was raving about them.